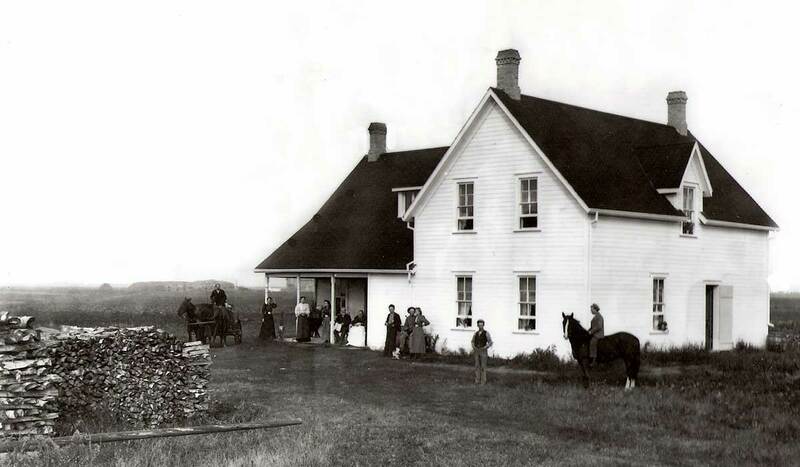 One of our ongoing C/DMHAC projects has been to collect information and stories about early homesteads and family farms in the Carman/Dufferin area. We have described elsewhere (Recent History > News and Events January 2019) how formation of the Province of Manitoba opened the territory to an unprecedented land rush. Post-1870, the land was surveyed into townships and sections and opened for homesteading. Specified sections were reserved for groups such as the Hudson’s Bay Company, railways and schools. Provision also was made for those already in the Province to claim property rights. This included 1.4 million acres of land that was to be allocated for Métis heads of family and their children. In the following accounts, families tell us what they know about the family farm—why their ancestors came to the area, how they arrived, what the country was like at that time and how it changed and was handed down over the years. Hopefully this project will encourage families to record and preserve their memories and pass them along to future generations. As of 2019, members of the McGill family have farmed Section 8-6-3W for the past 127 years. William McGill and a son James came from Janetville, Ontario, to the Homewood and Roland districts in 1890. James worked for the La Pointe family at Roland and William purchased section 8-6-3W, half from the Hudson’s Bay Co. and the other half from a Mr. Cowan who had purchased it earlier from the company. Under the Dominion Land Act of 1872, the HBC had retained ownership and right sell to sections 8 and 26 of every township. 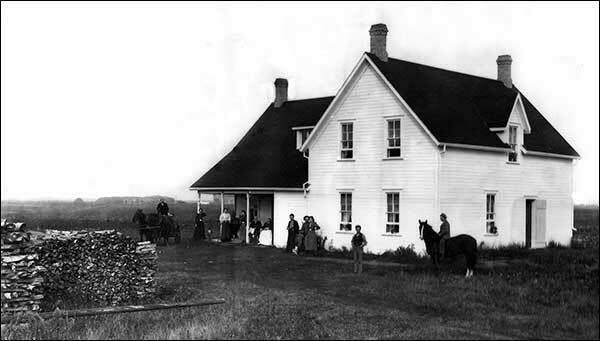 William returned to Ontario in 1891 and came back to Manitoba later that year with his wife, Susannah, twelve children, and enough lumber to build a large sixteen-room house and a barn. At that time the railway only came as far as Barnsley, so the lumber was loaded onto Red River carts and transported to NE 8-6-3. In 1919, the sixteen-room house was split in half and one part was moved to NW 8-6-3W. It was rolled on logs and pulled by mules. This part of the house now has the 6th generation of the McGill family living in it. A barn built on this quarter burned in 1927, was replaced in 1929, and is still standing. William and Susannah retired to Carman in 1904. William died in 1909 and Susannah died in 1912. Robert McGill took over the east half of the farm in 1904 and farmed it until 1941 when he and his wife Gertrude retired to Winnipeg. The story goes that Gertrude was asked if she wanted hardwood floors or a Delco plant* for the house. This was long before hydro service and she chose the Delco plant, probably installed early 1900s. The east half of 8-6-3 was then farmed by their son, Earle and his wife Dorothy; they also farmed SE 16-6-3 which they had purchased in 1936. This was the quarter originally owned by Earle’s grandfather, William McGill. By 1961, Earle’s eldest son Barrie married Mary Cox and built a house in the same yard. In 1972 they purchased SW 8-6-3 from the Morley McGill estate. Stanley, son of William and Susannah, purchased the west half of 8-6-3 in 1904 and farmed it until 1914 when he sold it to his brother David and wife Alberta who farmed it until 1950. They retired to Carman and their son Morley continued farming until his sudden death in 1972. Earle’s second son, Brian, a banker, and wife Caroll, a nurse, returned to farming in 1965 after purchasing SE16-6-3 from Brian’s father. In 1972 they purchased the NW 8-6-3 from the Morley McGill estate; that fall they moved into the half of the original house that had been moved in 1919. Earle and son Barrie both raised registered shorthorn cattle. Following Brian’s death in 1995, Caroll and their youngest son Danny continued to farm together until Caroll moved to Carman in 2000. In 2004, Danny married Renelle Dietz. With the addition of their son Evan in 2015, they are the 5th and 6th generations to live in the house built in 1892 and to farm the remaining quarters, NW 8-6-3 and SE 8-6-3, of the original McGill section. The rest of the property was sold in 2007. While planning for the farm’s centennial in 1992, the earliest land title records the family could find were for 1892. They were also informed that section 8-6-3W1 was believed to be the only section in one block to be held for a century by the same family. The Centennial was held on NE 8-6-3 where the original sixteen-room house had been constructed. The house was decorated in 1890s fashion with many of the original antiques and complemented by a display of vintage machinery and cars. *a combination of gas-powered generator and storage batteries used to produce electricity. ** Caroll McGill has carried on this tradition of community involvement through her work with the Ladies Section of the DAS, as President of the Homewood Community Club, 4-H leader and many years of active service with the Dufferin Historical Society and Museum. She has a keen interest in cultivation of native plants. Homewood Reunion 2018 - Family History section. James and Margaret McIntosh and their first three children (Margaret, Jessie, Alexander) came to Manitoba from Northern Scotland in 1885. They arrived via Emerson where they were met by Margaret’s brother, George Durno, who had homesteaded the previous year. The party travelled by team and wagon to the Stephenfield area where James applied for homestead rights to SE 32-6-6w, in the same section as George Durno’s claim on NW 32-6-6w. They later homesteaded NE 32-6-6w and purchased NE 29-6-6w, a ‘school section’ from which taxes went to maintain the school. The claim on Section 29 was in Margaret’s name; it is still in the family, owned by a granddaughter, Marjorie (Gibson) Irwin, daughter of Ellen (McIntosh) Gibson. Settlers came to this area because there were lots of trees and water in shallow wells. The family built a log home where they lived until they put up a frame house in about 1908. When this house burned in 1947, everything in the house was lost. This included wooden willow chairs made by the Indigenous people who used a trail through the property. They would stop at the house as they passed and Grandma McIntosh gave them bread and vegetables from her garden. In return, they made the wooden willow chairs for her. Three more McIntosh children were born at Stephenfield: Ellen, James and Christine. 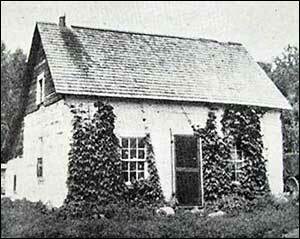 The children attended Ravenswood School which was northeast of the farm. The family got their mail at Almassippi post office which opened in 1885 on NW 34-6-6w. Providing for the family wasn’t simple in those days. Grandpa McIntosh took wheat to be ground into flour at Nelsonville, a two-day trip with horses and wagon. The family had a root pit in the yard where they stored garden vegetables for winter use. James Sr. served on the Dufferin Council prior to his death in 1916. In 1921, my father, James Jr., took over the farm and lived there with his sister Chrissy until he married Maggie Findlay in 1924. They had four children: Irene, James, Jean and myself (Nedra). The farm was a mixed farm with cows, horses, pigs and sheep. They also grew grain and had hay land. James served on the Stephenfield School board for a short time. He owned the farm until his death in 1966. In the 1970s, my mother turned the farm over to my brother Jim and his wife Joan. They had three children: James, Brian and Marlene. Jim and Joan passed the land to their sons, Jim and Brian. It has now been sold and no longer is in the McIntosh name.